The sibling relationship is often the longest familial relationship and siblings are likely to be the most constant companions in the lifelong journey of their brothers or sisters with a developmental disability. 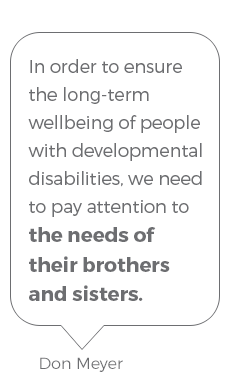 As a result, ensuring the long-term wellbeing of a sibling with a disability requires identifying, considering and supporting the changing needs and challenges of a brother or sister over time. With this in mind, the Sibling Collaborative has prepared a report, Understanding the Sibling Experience, to better understand the typical sibling in relation to their own life, the life of their brother or sister with a developmental disability, and their family as a whole. In doing so, we believe that we can better support siblings. And when siblings are supported, the entire family is strengthened. Realizing Change with Compassion: We take action with the critical input and consideration of our brothers and sisters with a disability and our families. Mutual Respect: We give people agency over their own lives, with consideration for all those involved. Collective Solutions: We find a way forward by learning, working and co-creating together. Unlocking Potential: We hold a big and bold vision for our brothers and sisters, as well as our families. Our intrinsic creativity and resourcefulness knows no limit. The Sibling Collaborative believes that individuals supporting a brother or sister with a developmental disability can, over their lifetime, experience significant stress in their roles. This stress is compounded by a lack of helpful tools, resources and information to guide, inform and support them. To test this and other related assumptions, the Sibling Collaborative launched an online survey in the fall of 2017. The primary objective of the Sibling Needs Assessment Survey (“sibling survey”) was to gain a deeper understanding of individuals and the many challenges they face while supporting their brother or sister with a developmental disability; the relevant areas in which they would appreciate tools, resources and information; as well as how and in what ways they would like to receive the identified materials. The Sibling Collaborative intends to use the survey responses and findings to advocate for the development and distribution of resources that adult siblings both need and desire. The survey, which targeted adults (20 years of age or older) residing in Canada with a brother or sister with a developmental disability, received a total of 360 responses. The developmental disability included a broad range of conditions that affect a person's ability to learn and usually last throughout his or her lifetime. A few examples of a such a disability might include, but are not limited to, autism spectrum disorders, Down syndrome or Fragile X syndrome. This report is just the beginning. We hope you will be part of the journey forward for those of us with a brother or sister with a developmental disability. Join the discussion among Canadian siblings on our Facebook page. Be part of our Sibling Collaborative - you can join right now by clicking on the green button to your left. If you haven't already provided us with your email address and are interested in future events, meet-ups or information, join our email list or email info@siblingcollaborative.org to learn more.